Sometimes I suffer from a great deal of (completely unnecessary) doubt whether my own photography can truthfully fit the commonly accepted definition of "street photography". It can sometimes be confusing when, by example, a street photography- or travel photography group rejects my submission on the basis of it not conforming with their rules, which usually consist of their own interpretation or definition of "Street Photography" (or "travel" for that matter). 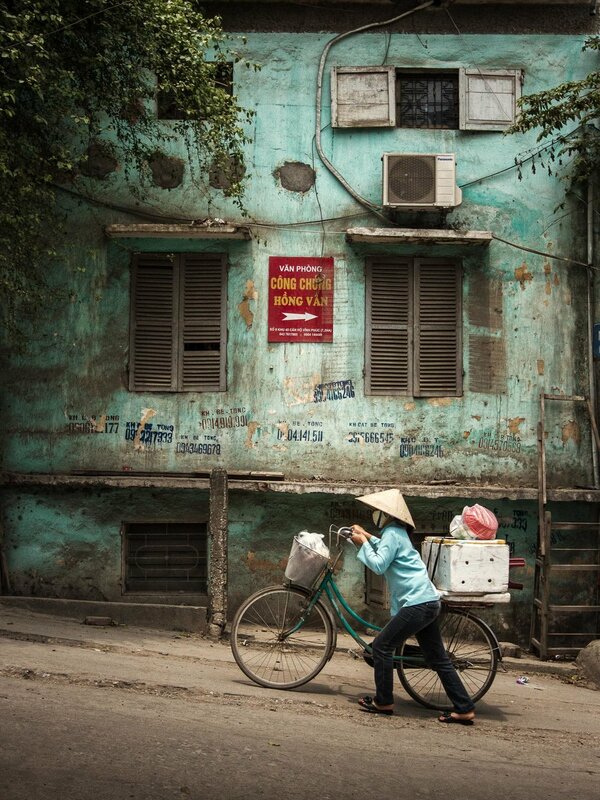 Urban Hoi An (Vietnam). Would this be a Street Photograph, or a Travel Photograph? Some street photography aficionados insist that "subject" should be "human subject", thereby believing by implication that it cannot be street photography unless it contains one or more people. When I consider the wider definition to include the other key words, being "candid" and "public", I question which photography genre would describe images of (say) a dog as a candid subject in the same public context. Are we then moving over towards "pet photography" or "wildlife photography"? Surely this is a NO! This should still be street photography, as "wildlife" can be defined as "non-domesticated animals" and "pet photography" (I guess) focuses on the love relationship between a domestic animal and it's owner. While dissecting the key word "subject" as not meaning exclusively "human subject", many other genres seem to intersect with street photography via the remaining two key words. These could be documentary-, travel-, urbex-, urban landscapes- and even architectural photography. When isolating the key word "candid", this immediately challenges one's understanding of travel- and documentary photography, as well as street portraiture in all its forms. In the case of documentary photography, Urban Picnic Street Photography (UPSP) provides a rather clear and concise description of the differences between the two. It states that street photography is defined by it's candidness, while documentary photography can also be candid (but not necessarily). It further goes on to state that documentary "has the definite intention of recording history". It is therefore clear that street- and documentary photography are very much related, and sometimes both fit the same defining criteria. In the same breath, I'd say that travel photography is an equally snug fit to this party. But where does street portraiture and environmental portraits then fit in? When a portrait is candid, clearly it fits the definition. If it was posed in any way, it is no longer candid, thus how do we categorize non-candid street portraits, street fashion photography etc.? Both of these genres still comply with the "subjects" and "public" criteria. There seems to be fairly common agreement that "public" is not purely limited to the streets, contrary to what "street photography" suggest in its literal form. The definition allows for a wide variety of environments, which (confusingly) doesn't exclude any rural environment, or even shots taken on (or in) water. Here again I question where does street photography end and become (by example) travel-, documentary-, urbex-, event- and music photography? All of these fit the "public" criteria in one way or another, but not necessarily either "subject" or "candid". In an effort to condense the research I've done for this posting into a sensible conclusion, I'd say that street photography does not exist as a free-standing genre, but is part of a larger group of intersecting genres. In certain isolated conditions, street photography can exists as a pure concept, but even then, it doesn't mean that it doesn't share qualities with parts (or even whole) of related genres. The group of genres - let's call it the "Street Genres Group" all seem to share at least two of the three key words "candid", "subjects" and "public", as can be seen in this rather boring graphic. Where all three criteria are present, it gets closer to pure street photography. If the "candid" element is missing, it could be documentary-, travel-, street portraits, environmental portraits, urban landscapes photography, etc. If "subject" is missing, it could again be documentary-, travel-, urbex- and urban landscape photography. When the "public" criteria is missing, it could spill over towards the likes of documentary-, travel-, street portraits and environmental portraits and urbex photography. Each individual genre within the "Street Genres Group" can equally be dissected even more in exactly the same way, but they all remain related to the Street Photography as long as they share at least two of the three key criteria. It's also worth noting that documentary- and travel photography both seem to be able to exist in any two combinations of the three key words, as well as all of them. There may be others which I've missed. To conclude, I think I can put this matter to rest, safe in the knowledge that Street Photography hardly ever exist in isolation and cannot be so clearly defined as a pure, free-standing genre. Does it then mean that I am not really a Street Photographer? I'd have to say "no". As long as somebody dabbles in the "Street Genres", for all practical purposes he / she can still strictly be defined as a Street Photographer. We may each tend towards 'specializing" in another related field, or even move among the various fields. It's only when your specialization or preferences move towards only one of the key criteria words, or completely different criteria, where one ceases to be a defined Street Photographer. Took a while to try and figure this out. Any comments and thoughts are welcome!